Um, make sure to double check. 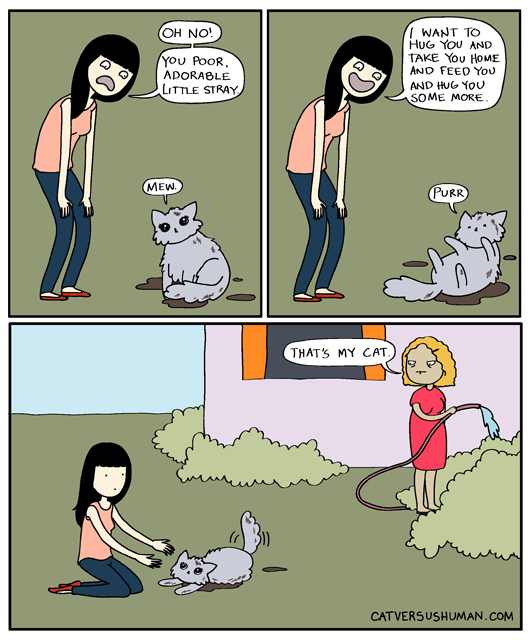 Totally something I'm thinking of when I see a stray at the corner of my street. So cute and cuddly... but then, he's so chunky I don't know if he's really living outdoors. Bless your heart for taking care of this poor kitty! I'm my neighbours cats side chick because I feed him, give him water and shelter, and pet him and care for him and my neighbour leaves him outside, unfixed, unvetted, without food or water. My neighbour is starting to catch on, though, because he rushes after my car and to my car when I come home and follows me everywhere. Oops. This is great information.. Awesome ideas Thanks.. Thanks for the Amazing information in the post. discoverworldwide What a funny cartoon! nice post. I have got joys to read this.